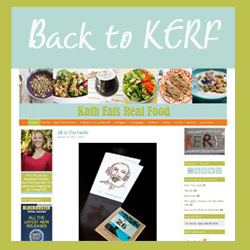 As I mentioned in my KERF post this week, I’m finally starting to really feel pregnant on the outside. Those around me are telling me so too. 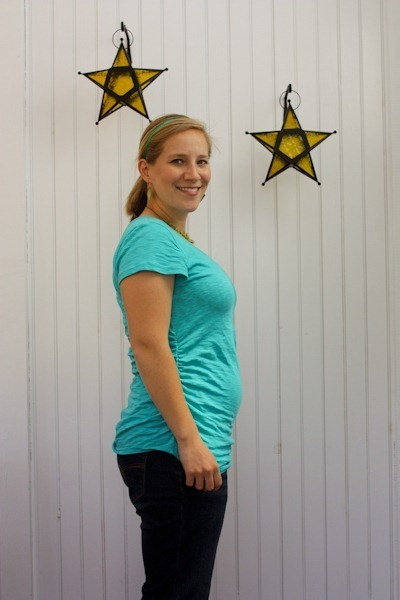 The bump is rounding out, and I imagine this is the beginning of a growth spurt! The movements began early on as vibrations, taps and little pops but as of this week they are more like tugs or punches. 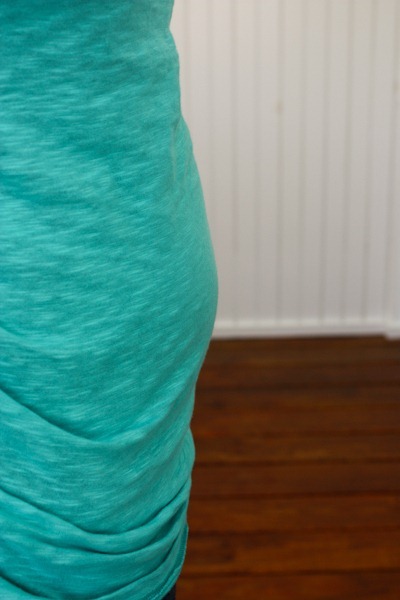 It feels like a part of my bump hardens or tightens when he moves across, although I don’t think it’s really getting hard like a contraction or anything. That’s just the best way I can describe it. I think it’s just the pressure from inside. Love the feeling so much! I’ve started to cup my stomach when I walk upstairs or am just a bit tired sometimes. Not that it’s heavy or anything, but I think I let it hang out more during these times so it feels good to give it some extra support. Maybe I should get one of those belts to wear when it really does start to get heavy? I’m feeling really good in general, full of energy and with almost zero food aversions. Sleeping is going OK again and other than a few minor symptoms, nothing is bothering me. I must be in that sweet spot of the second tri! Even felt good enough to run a bit this week, which says a lot about my energy levels. 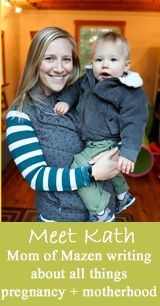 I’ve read on some of my apps that the baby’s senses are fine tuning and he should be able to hear my voice. But I haven’t actually talked directly to him out loud yet (only a little in my head ) I still feel a little bit like I’d be talking to myself, but maybe when he’s a little bigger, it will be more like he’s listening. Perhaps I should start with singing! Matt and I have started testing a few of the names we like. Picking a name is going to be hard, but we have narrowed it down to a handful, all pretty non-traditional. One just feels more right than the rest, but it’s so difficult to really decide. I imagine we won’t officially declare the name until we see him for the first time, so we won’t be sharing it to family or the internet until that day. But the name at the top of our list plus the middle name we’re leaning towards together have a lot of meaning that just kind of happened by accident, and I’m excited about that! We’ve also started giving him a personality and acting like he’s here, making decisions and giving opinions . “The baby is tried today. The baby would like cheese for dinner. The baby really likes this song.” It’s been fun and a way to get used to there being 3 of us. Sucking in doesn’t do much these days…might just stop adding in this photo because you can’t really tell I’m sucking in anymore other than my lame facial expression in these photos! I hit my stomach with the bar in Body Pump this week two times in a row. Must be grow time! One week till I’m halfway there! SO hard to believe! You’re looking wonderful! 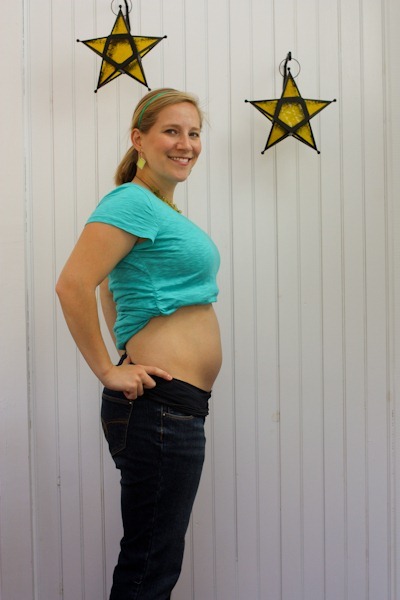 I am starting to miss the energy the closer I get to the third trimester (only 10 days away!) so enjoy it! Cute post! Ben & I agreed on a name in about 5 minutes. It was one of the quickest decisions we’ve ever made together and I am still SO surprised how fast we agreed! We went back and forth on her middle name a little bit, but it was just a toss up between 2 names. Once we decided, we’ve never looked back! I have not felt too much movement, and I am only two weeks behind you, I think. But everyone feels movement at different times. Baby kicks were my all time favorite part of pregnancy (even though eventually those kicks are goona hurt)! It is amazing how much you can tell about your baby when he is inside of you. I KNEW he was long and had big ol’ feet and I was proven right when he was born. I totally agree with keeping the name to yourself till he is born. We didn’t and I really regret that. Family members used the name for shower favors and some even sent us personalized gifts ahead of time. While sweet, I really believe you need to see your child in person to know for sure you picked the right name. A good friend of mine had twins and had her babies named in her belly, but when they were born she knew she had the names backwards! Your posts are almost making me miss being pregnant! Don’t worry, the thought of a one year old and a new baby is not 😉 You look great! Enjoy that sweet spot in the second/ early third tri. I think my sweet spot ended around week 34. The baby has dropped now, and while I can breathe again…I am beginning to wish I had bought one o those support belts! It’s actually not so bad…but yesterday I wore a dress all day and by the end of the day could feel the difference from when I wear pants. you look GREAT! i love that light blue color on you too! i now know your “secret” of holding your camera remote in your hand in these photos from that recent post you wrote on KERF about photography. hehe. 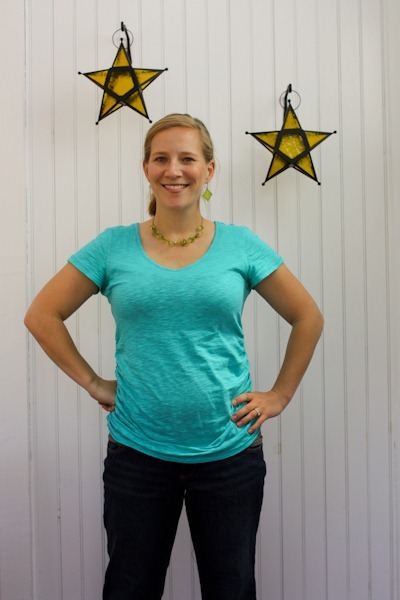 Kath, just curious – why do you always wear two shirts? Is it chilly in CVille? I do, too! I always wear a tank top under my shirts it just makes me feel more smooth! Kath you’re glowing and look fabulous! So happy you’re feeling so good and excited about it all..SUCH a fun & exciting time in life! 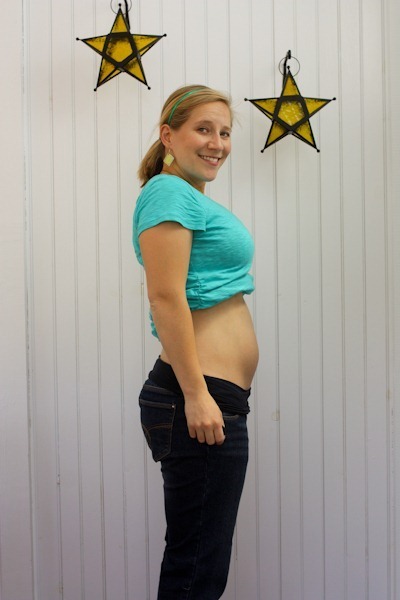 awww your belly definitely looks like it has grown this week! and I love the color of that shirt…. so pretty!! i love the sucking in pics tho!!!! it almost makes ur bump show up more now actually! like more round 🙂 U look great and ur bump does too!!! thanks again for sharing your journey with us!!!! Sorry, but you have a long time to wait! We just started trying out names today— so crazy. It is such a HUGE decision! We’ll be keeping ours under wraps too till the baby is born, plus we need to make sure it fits before we decide for sure. You’re looking great and I’m glad to hear that you are feeling well! I would def say beginning of a growth spurt. Right around these weeks for me, I totally popped! I mean, I remember feeling like I was getting bigger. Then one day: POP. Seriously. It’s very fun 🙂 Yay! You guys are so cute – I absolutely LOVED this part of pregnancy (oh, who am I kidding, I loved most of it) – the soft baby kicks, the feel of the belly movement. 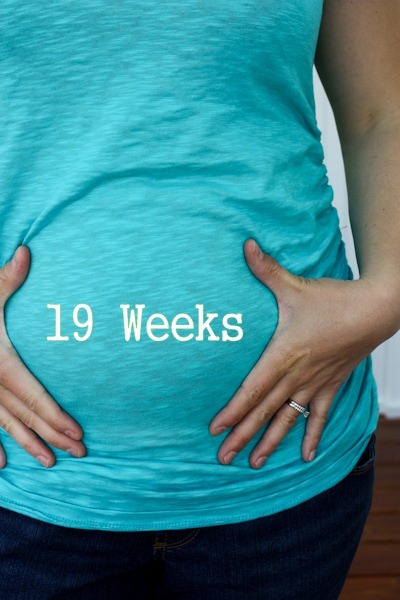 Happy 19 weeks! I used one of those maternity belts with each of my pregnancies and towards the end they helped GREATLY. I highly recommend them because they help to hold your belly up which keeps you from having discomfort in your belly and lower back. Do you have a Motherhood Maternity store near you? That’s where I got mine and they also have a lot of cute clothes there, as well. Glad you are feeling great. I used to find cupping the baby bump, even at the early stages, was more of a comforting for me (and I guess the baby), rather than my wee bump actually needing the support. 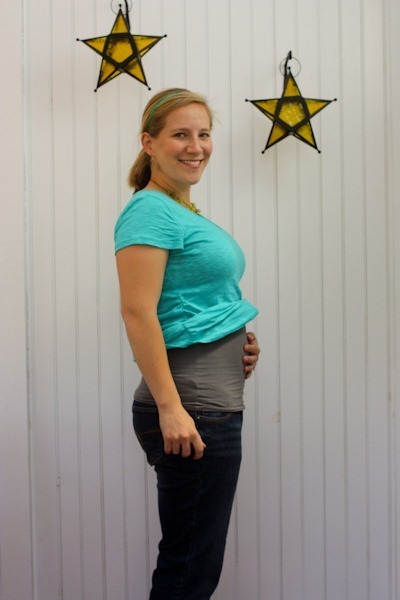 But once I had a big preggers bump, I liked the support bands, they improved my posture for sure. You’ll be surprised at how opinionated your baby will be about the clothes you wear (he won’t like certain pants and waistband styles) and the positions you sit in.. haha. I had this one pair of those under-waist maternity pants and my oldest HATED it when I wore them.. she would sit there elbowing the area where the waistband was all day.. especially when I was sitting. So I quickly learned NOT to wear them. After that, I stuck with the over-the-belly type bands.. Oh, and not sure if you’re found them or not but Target has this line of undershirts that are kind of like those belly bands, but since they’re like camisoles it’s like an all over support. I LOVED them while pregnant, plus they were great after having the baby because they continued to support you while you’re body is in those recovery stages..